Years ago, Amazon introduced KDP Select to authors who publish with Kindle Direct Publishing. The idea was to create a huge library of Kindle eBooks from which select customers could borrow books for free. Authors are paid a royalty, but not the same royalty as for an ordinary paid sale. Although the nature of KDP Select has changed over the years, the program has grown tremendously. Let’s reevaluate the KDP Select decision. Is enrolling your book in KDP Select worth it? There really is only a single drawback to enrolling a book in KDP Select, but it’s a big one: You’re not allowed to publish the digital version of your book anywhere else (like Smashwords, Nook, or Kobo) while your book is enrolled in KDP Select. WHY WOULD AUTHORS GIVE UP THE CHANCE TO PUBLISH THEIR EBOOKS WITH NOOK, KOBO, APPLE, ETC.? Obviously, you would need to receive some other incentive(s) that are even better than the royalties that you would earn from customers using those other brands of eReaders. That’s what you need to do. 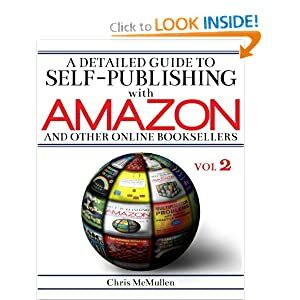 You need to look at the incentives that Amazon KDP offers and consider whether they are good enough for your specific book to make it worthwhile to publish your eBook exclusively with Amazon. Let’s look at what KDP Select has to offer in 2019. That depends on your book, but the potential is certainly there. But first, let me briefly describe Kindle Unlimited. I’m actually a Kindle Unlimited customer myself. Customers pay about $10 per month (in the US) to subscribe to Kindle Unlimited, and this allows them to borrow as many Kindle Unlimited books per month as they would like. They can borrow up to 10 different books at a time, but they can read more than that: They simply need to return one of those 10 books before borrowing another one. 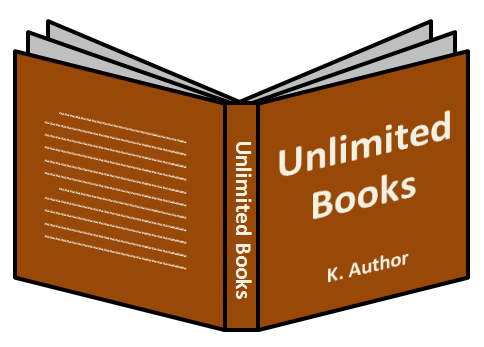 How does Kindle Unlimited have the potential to help authors? Each month, Amazon pays authors of KDP Select books over $20,000,000 in royalties for books read through Kindle Unlimited. That’s in addition to what Amazon pays for royalties for ordinary sales. That figure is staggering. In the beginning, it started at just a few million and has steadily grown to over twenty million. 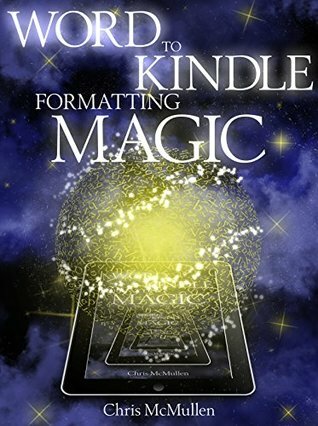 A book that is successful in Kindle Unlimited can draw significant royalties. This are no guarantees, and not all books thrive in the program, but the potential is there, and there are thousands of books that do thrive in the program. That’s a huge customer base. A single customer pays Amazon about $10 per month to subscribe to Kindle Unlimited, and Amazon turns around and pays KDP Select authors over $20,000,000 per month. Kindle Unlimited helps to make it affordable to read books. If you read a handful of books per month on average, it’s far cheaper to pay about $10 per month for Kindle Unlimited than it is to buy books individually (unless you only read 99-cent books). Very often, the books that I read are priced $5.99 or above, so all I need to do is average two books per month and I’ve already saved money with my subscription. I strongly feel that more people should read and that they should read more often, and that it should be an affordable habit. Kindle Unlimited encourages this. Kindle Unlimited currently encourages KDP Select authors to engage readers. Kindle Unlimited currently pays authors royalties for Kindle Unlimited borrows based on how many pages customers read. If you write content that engages customers, you will have more pages read. Not everyone is a fan of this, and if you think about every type of book available on the market you might find some cases where it seems unfair, but the concept appeals to me. I like that Amazon is rewarding reader engagement. As a writer, I want to engage my readers. Amazon and I share this common goal. Kindle Unlimited is also a huge library. With fiction, it’s an entertainment base. With nonfiction, it’s a knowledge base. It’s low-cost education. 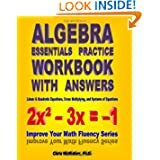 I’m an author of nonfiction books, and I’m glad to have my knowledge available in Amazon’s enormous library. The potential can be alluring. That’s what attracts authors into the program. But that’s just the potential. Not all books succeed in the program. Enrolling in KDP Select isn’t the best option for 100% of books. What you want to know is how well KDP Select will work for your specific book. However, there are still a couple of other benefits that KDP Select has to offer. Let’s discuss those, and then we’ll get to the issue of weighing the pros versus the cons. WHAT ELSE DOES KDP SELECT HAVE TO OFFER? The main thing was Kindle Unlimited. It’s so much the main thing that if Kindle Unlimited doesn’t work out for you, then KDP Select probably isn’t right for you. But there are other incentives, and if you do enroll, you may wish to take advantage of them. However, that page isn’t easy for customers to find (and the name Countdown Deal isn’t nearly as attractive as it could have been). Plus, there is no guarantee that your book would even be visible on that page. What you really need is to either have good book marketing skills, a strong active following (of an email newsletter, for example), or to get accepted by BookBub (the most popular option, but also the most expensive), E-reader News Today, or many of the smaller services that help authors promote sale prices. Instead of running a Kindle Countdown Deal, you could run a KDP Select free promo. The free promo makes your book free during the promotion, and unlike the Countdown Deal, you earn zero royalty during the promotion. (Well, you can technically earn zero royalty during a Countdown Deal. You need to first do the math and see what royalty, if any, you would earn during the Countdown Deal. The larger your file size, there more this may be an issue.) You also get a free sales rank instead of the usual paid sales rank during the free promo, and your paid sales rank has usually slipped considerably once the free promo ends. Unless the free promo works and creates enough interest in your book to result in several sales after the free promo. But like the Countdown Deal, you probably get much out of the tool unless you find an effective way to promote it. Simply making your book free and doing nothing else won’t likely help much (although this had been effective years ago when it first came out). There may be something better than these tools that doesn’t require you to do anything at all. What is that? A boost in sales rank. How can KDP Select help with your Amazon.com sales rank? Every Kindle Unlimited (and Amazon Prime) borrow of your book helps your book’s sales rank at Amazon. Even if the customer hardly reads any pages. A single borrow has the same effect as a single ordinary paid sale. There is another way to look at it: If you don’t enroll in KDP Select, you won’t have Kindle Unlimited borrows helping your sales rank. Sales rank helps in various ways with visibility on Amazon. It’s not as compelling as Kindle Unlimited itself, but it is something to consider. Every book in Kindle Unlimited that has a sales rank: That sales rank is benefiting from Kindle Unlimited borrows. Whatever the sales rank is, it would be worse without Kindle Unlimited (unless of course the book never gets borrowed at all). SHOULD YOU ENROLL YOUR BOOK IN KDP SELECT? Unfortunately, this depends on things that we can’t know for sure. First of all, how many customers would read your book through Kindle Unlimited? Even if you knew that, you would then need to figure out how much you would earn in royalties for Kindle Unlimited borrows. Amazon currently pays on average a little under $0.005 per “normalized” page read through Kindle Unlimited. For most books, a “normalized” page turns out to be a little generous, meaning that it probably turns out to be more favorable than what you would call a “page.” But you have to first enroll in KDP Select before you can find out what your KENPC is (that’s the official page count for your book). $0.005 doesn’t sound like much. You would need 200 “pages” read just to earn $1. So what really matters is how many pages will be read. There are books with tens of thousands (or hundreds of thousands, or even millions) of pages being read per day. If you write highly engaging content and if your book thrives in Kindle Unlimited, the royalties for pages read can really add up. Far more important than your book’s page count are reader engagement and the customer appeal of your book (and its cover and product page). Even if you knew how much your book would earn in royalties from Kindle Unlimited borrows, you would also need to know how much your book would have earned from sales on Nook, Kobo, Apple, etc. Kindle is the dominant eBook market. If you’re among the few authors with a really good idea and solid marketing plan for how to drive sales to other platforms, that would be a strong incentive to not enroll in KDP Select. If you have a good idea for how to appeal to Kindle Unlimited, that would be a strong incentive to enroll in KDP Select. Otherwise, would you rather take your chances with Kindle Unlimited, or take your chances with other retailers? The only way you can really know for sure is to try it both ways and compare. Actually, you can try it both ways. But not at the same time from the beginning. You could enroll in KDP Select for 90 days. If it’s not going as well as you like, you could opt out before the 90-day term ends. (Be sure to do this successfully.) Once you successfully opt out and once the first 90-day term is up, then you could publish with other retailers. Whatever you choose to do, I hope it works out well for you. Good luck. By chrismcmullen  Posted in amazon, Kindle Direct Publishing, Kindle Owners Lending Library, KOLL, self publishing	 Tagged 2019, KDP Select, Kindle Unlimited, pages read, should I enroll in KDP Select? What Will Kindle Unlimited Pay? We won’t find out for sure until a couple of weeks into July. In the meantime, the best we can do is make predictions based on what limited data we do have. When July, 2014 began, the KDP Select Global Fund was $1.2 million. This was to be distributed among Amazon Prime borrows of KDP Select books in the US and UK. Prior to the introduction of Kindle Unlimited, Amazon typically paid approximately $2 per Amazon Prime borrow. Kindle Unlimited was introduced a little over halfway through the month of July. $800,000 was added to the KDP Select Global Fund, bringing the total fund to $2 million. Another $785,000 has since been added, bringing the fund to $2,785,000. A big factor will be that customers can download several Kindle e-books through Kindle Unlimited, whereas Amazon Prime customers can only borrow one book per month. Thus, the total number of downloads/borrows can be expected to be much higher than the typical number of KDP Select borrows has been in the past. This will likely reduce the KOLL payments for July, 2014 compared to previous months. Keep in mind that there are likely to be excessive downloads through Kindle Unlimited for the first couple of months of the program, but this will likely taper off and become steady thereafter. Likely, the KOLL payments will rise somewhat, if not return to normal, by September, 2014. Update: The results are in now. Kindle Unlimited paid $1.81 per borrow/download in July, 2014, much higher than I was expecting. This is largely due to an unexpected increase in the KOLL fund from $2,000,000 to $2,785,000. I will base my prediction on the variety of Kindle e-books that I see in my sales reports. 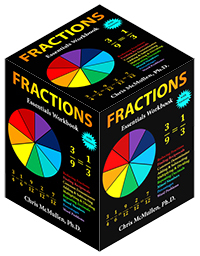 I will also show you how to do the calculation so that you can compare with your own numbers. D = total number of borrows/downloads thru July 30. C = total number of borrows thru July 17. Take the original KDP Select Global Fund of $1.2 million and divide by $2. This equals 600,000. This estimates how many Amazon Prime borrows in the US and UK combined Amazon was predicting prior to the debut of Kindle Unlimited. Define B = C x 30 / 17. In my example, B = 9 x 30 / 17 = 16. This approximates how many borrows you would have had without the introduction of Kindle Unlimited (assuming roughly equal likelihood of borrows on any day throughout the month). Define A = D / B. 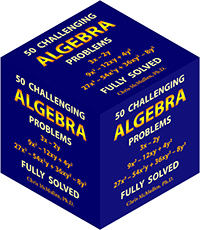 In my example, A = 48 / 16 = 3. This approximates by which factor your total number of borrows/downloads increased as a result of Kindle Unlimited. Divide $2 million by N. In my example, this is $2 million / 1.8 million = $1.11. This is your prediction for how much each borrow/download will pay. The closer the data for your own books happens to be to the true (unknown, as of yet) average, the better your prediction will be. Update: Divide $2,785,000 by N, since Amazon added an extra $785,000 to the global fund. Based on what limited data I have, I’m predicting that KDP Select borrows/Kindle Unlimited downloads will pay between $1.10 and $1.25 apiece for July, 2014. You heard it here first. (But if I turn out to be way off, please forget that.) Update: My range changes to $1.53 to $1.74 based on this increased fund. Although I have a variety of Kindle e-books on my sales reports, just like you, my data could be well below or well above average. So the actual payment could be much higher or lower. So, to be safe, I’m going to widen my prediction to $0.85 to $1.50. 🙂 This changes to $1.18 to $2.09 based on the increased global fund. If Amazon adds to the KDP Select Global Fund for July, 2014, that may change my prediction considerably. Indeed, Amazon did add another $785,000 to the global fund. I would like to believe that it will be closer to $2 than my data projects, and that may very well turn out to be the case. Authors and Amazon both would probably like for KOLL to pay closer to $2. Doesn’t mean it’s going to happen, though. Let’s cross our fingers, just in case. What is your prediction based on your data? The more numbers we see in the comments section, the more data we’ll have to judge by. You don’t have to say how many borrows you’ve had. But whatever your prediction turns out to be, that would be appreciated. That brings my overall number of borrows/downloads for the month to roughly 3 times the usual number of borrows. Hence my prediction of $1.10 to $1.25 for July, 2014. In comparison, my Kindle sales were 15% more frequent than normal from July 18 thru July 30. Yes, my sales improved, too. I would attribute that to the improved sales rank resulting from the many additional downloads in Kindle Unlimited. Strangely, my best day for Kindle sales in July, 2014 was July 28. My best day for borrows/downloads was July 24. Kindle Unlimited downloads held fairly steady for me all the way thru the 30th, though I’ve heard from others that downloads have tapered off for them. How Much Do KDP Select Borrows Pay? With the introduction of Kindle Unlimited (read more about Kindle Unlimited by clicking here), many authors are wondering how much Amazon will pay for each qualifying download (i.e. where the customer passes the 10% mark). Although that’s a complicated question (since customers can download several books through Kindle Unlimited, whereas Amazon Prime customers were only able to read one free KDP Select book per month), we do have data for KDP Select going back to the launch of the program in December 2011. So I went through my KDP monthly royalty reports for 2011, 2012, 2013, and thru June of 2014 to tabulate the KOLL per-borrow payments by month. You can see this displayed graphically above. Below, you will find the data in a table. The lowest KOLL payments were December, 2011 ($1.70) and January, 2012 ($1.60), when KDP Select was first introduced. The lowest KOLL payment was $1.60 (December, 2011) and the highest was $2.51 (October, 2013). The most recent KOLL payment was $2.24 (June, 2014). Most months, KOLL payments were $2 and a little change. The average KOLL payment since December, 2011 has been $2.15. 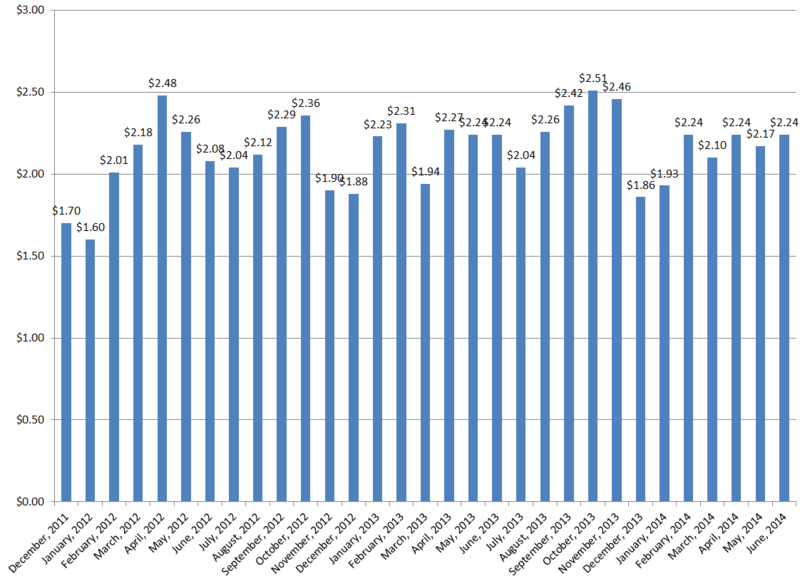 The average in 2012 was $2.10, in 2013 it was $2.23, and so far in 2014 it has been $2.15. Kindle Unlimited offers unlimited downloads, whereas Amazon Prime only permitted one free borrow. This may cause the Kindle Unlimited data to be considerably different from prior KDP Select data. Amazon has already added $800,000 to the KOLL Global Fund for July, 2014 (and Kindle Unlimited was only introduced with two weeks left in the month), bringing the total fund to $2,000,000 for July. Will this be enough to maintain per-borrow payments of about $2? That’s the million-dollar question. Update: The results are in now. Kindle Unlimited paid $1.81 per borrow/download in July, 2014, much higher than I was expecting. Update: More results: Kindle Unlimited paid $1.54 and $1.52 in August and September, 2014, respectively. Update: In October, 2014, Kindle Unlimited payments dropped down to $1.33.